Here’s something you may not know about me: I love thrift stores. If I see one, I gotta stop. This includes on vacations. 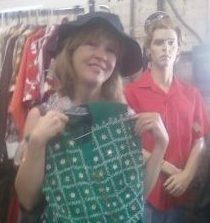 Anyway, I just wanted to tell you about a sleeveless top I found, not in a thrift store but in a consignment shop. Yes, it was a good deal and it looks lovely on me, but what I really want to show you is its tag. The top was made in Italy and was new, by which I mean it still had its original store tags. Everything, including care instructions, is in Italian. But one tag included an English translation, and I’m guessing whoever wrote it relied on Google translator. So yeah, the little shiny things down the front are Swarovski crystals. Pretty little top for $15, don’t you think? I bet if we compiled our favorite mistranslations, we’d have the makings of a great book. Something worthy to be read in bathrooms everywhere. Hahaha! How funny I read this on the same day we brought home the French exchange student from the airport! Poor thing is having a heck-of-a-time with our southern accents!! What state are you from, if you don’t mind my asking? Ooh, that’s a pretty accent. Maybe she doesn’t understand you, but at least you sound good! Aww thank you! Still, we’ll try to keep the “y’all” and “golly” to a minimum. Screw strongly and always on top!